Matching the memory to the cameras. A new form factor smacks me in the face. As a former boy scout I wanted to be prepared so I ordered two of the little buggers from Amazon. I opted for the Transcend 16 gigabyte versions that come with an SD card adapter. I put one (micro SD+SD adapter) into my Samsung NX 300 and everything seems to work as it should. I don't notice any increase or decrease in write time so I'm guessing the underlying tech is similar enough to be the same....to the camera. Jeez. Those cards are teeny-tiny. When I look at the one gigabyte IBM Microdrive sitting just to the left of the micro I can't help but be amazed at how far memory storage has come in a relatively short time. I'm sure I paid well over $200 for the IBM spinning miracle card when it first came out and I think I paid a whopping $14 for the little card with 16X the memory and I'm certain a much faster write time and, by comparison, infinitesimally small power usage. I'm planning to shoot Jpegs and I will have a tablet for back-up so I'm thinking that 32 GB is more than enough for a week of shooting. If I need more space I'll just buy a few more. Amazing to think that I could put enough in an SD case to last a long, long time. 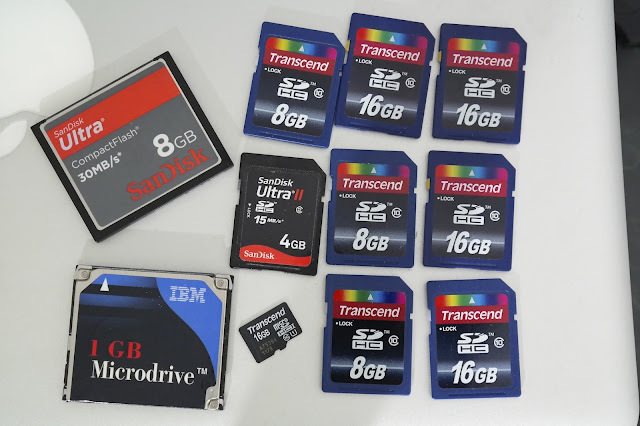 The rest of my gear (including the Samsung NX300 I'm taking along as a back up) takes SD cards and I've finally settled on the Transcend class 10 SDHC 16 GB cards as my standard. Big enough for a day of shooting and very cost effective. When they go on special I stock up. I have a crusty, old Leitz Tiltall monopod from the late 1970's that Belinda gave me as a birthday present. I use it all the time and I'm emotionally attached to it. But it's a three section monopod and that means it does not pack down small enough for international travel. I got an e-mail from Precision Camera on Friday and they were touting the little monopods from MeFoto. I like the colors and it took my a while to decide between "titanium" and the cool blue you see above. There are other colors but I'm conservative about my color palettes when it comes to hardware. At any rate I drove out to see the monopod and play with it and I liked it. The leg locks feel positive and well done and the tubes are channeled so they don't turn along with the locking collars when you lock or unlock. There's a hefty matching metal ball over on the screw mount end of the tripod and it has a little compass on it but it's otherwise just a gratuitous design addition. The round metal is dense so I imagine it might be useful, in a pinch, for driving tent pegs or something of that nature. I like the way it operated so I bought one. 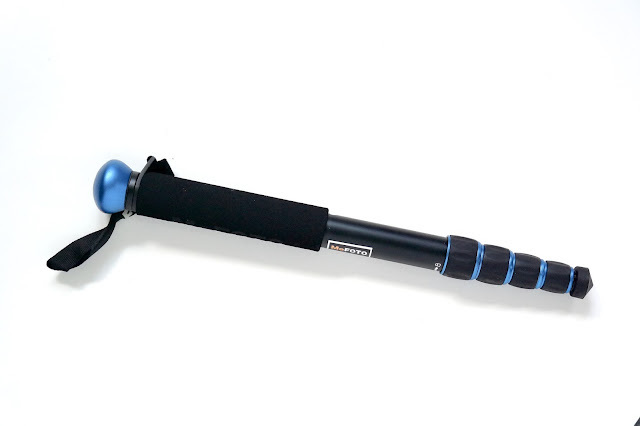 The call it the MeFoto Walkabout Monopod. 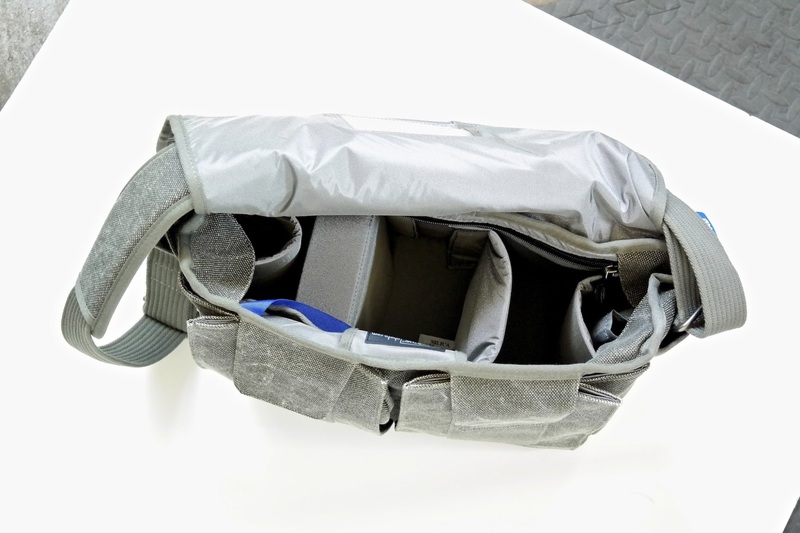 It's lightweight, fairly practical and pretty cheap at just under $60. I thought I'd stick it in my suitcase in case I get all Trey Ratliff-y and start taking HDR night shots. It could happen. Think Tank Retrospective 30 camera bag. We could write about camera bags for days and days and the resulting effect would be one big argument as the prissy Billingham boys squared off against the rat pack-y Domke canvas boys and we argued the merits of carrying everything you own in a big hernia inducing leather steamer trunk on a strap or barely carrying a mirrorless camera and a small sandwich in a bag that, brand new, looks like someone ran it over with a car. I have lots of bags but I've just come to believe that any fun trip is a thinly disguised excuse to buy a new bag. So I did. I bought the anonymous looking Think Tank, fungus colored Retrospective 30. It looks so oatmeal lumpy that no one will think, Wow! 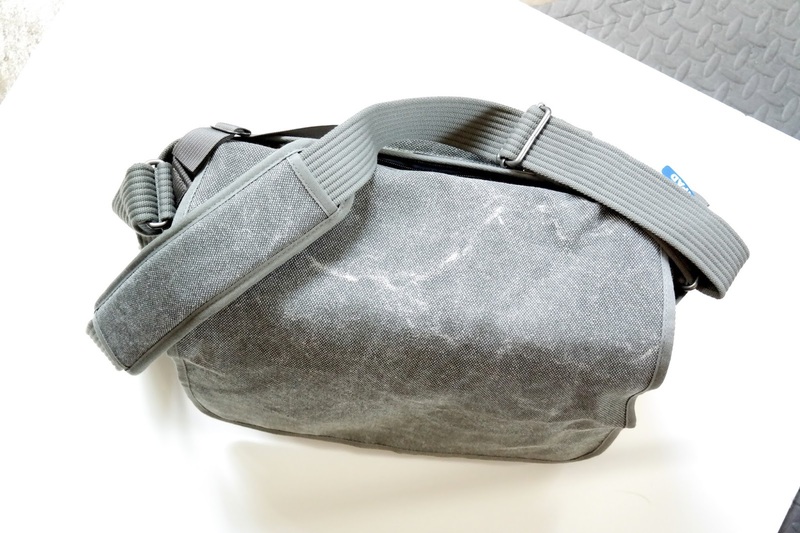 I wonder if this guy has a bunch of Leicas in there..." The next aesthetic step down is a Walmart diaper bag. But, the inside is very roomy, the front pockets billow out to take whatever you want to throw in them and the back area holds a big tablet without stress or strain. I thought I'd give it a try. new Think Tank Retrospective 30 from the top. Good velcro. And velco silencers. The Industry Ubiquitous Zoom H4n. Can you hear me now? Without noise? I've been toying around with doing dual sound on my video productions. I like the idea of having really clean sound that is controllable. I like the idea of being about to plug in two XLR mics and not having to have more boxes attached to the shooting camera. I was torn between the Tascam digital audio recorders and the Zoom products but my friends who do a lot of DSLR video production, almost to a person, have opted for the Zoom H4n and I figured that since this isn't my area of expertise I'd opt for the safety of the herd. So far the sound out of this little box is great. I've been practicing dual audio techniques and slating my stuff but I'm just going to plunk down for the software that syncs video and external audio up automatically and be done with it. 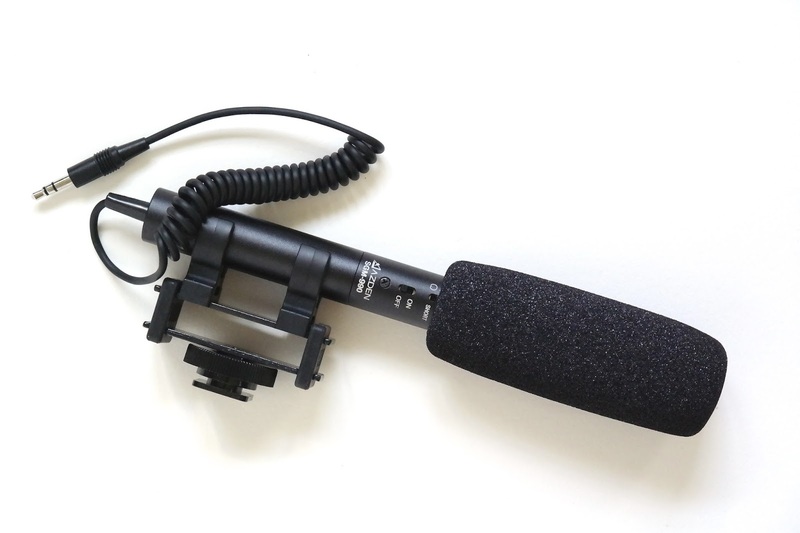 Azden Pocket Shotgun Microphone. My name, not theirs. They call it an SGM-990. I have some cool microphones that I really like. I'm very positive about the Rode NTG-2 and the new Rode VideoMic but they are all too big to drag along on a fun trip. And I don't have anyone coming along to hold the microphone pole and ride levels for me either. I wanted a little, pixie shotgun microphone that could hang out in the hotshoes of cameras and be ready at all times for those moments when I wanted to flop into the video mode and shoot some stuff moving around. But I wanted it to sound decent, run a long time on one battery and have the usual controls. I saw this little microphone in the sound case at Precision Camera and, for less than $100, I thought I'd take a chance. When I played with it back in the anechoic chamber in the main bunker at the Visual Science Lab world headquarters I was pleased at its well balanced sound. It's noisier that the NTG-2 and not as transparent but it does a much, much better job in most situations than the built in microphones on the DSLRs, DSLTs and Micro4:3 cameras. And it looks cool. Very important... It has a two setting control for the microphone pick up pattern. It can have more or less side and rear rejection. It also has an on off switch so you can leave the battery in and store it for a few days without coming up battery dead. I wouldn't use it as a primary production tool but for snapshot mode, street art mode and spontaneous interview mode it does a darn fine job. I want to see how it handles German. One week to go before total Samsung immersion. What a fun experiment. 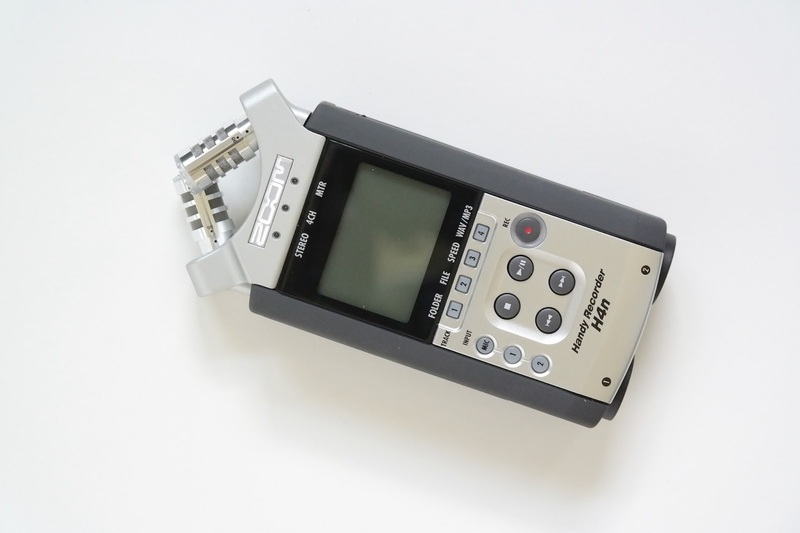 Will be interested to learn more about the H4n recorder and double-system sound. Is there much need to adjust in order to maintain sync over long running times? If using two XLR cables/connectors -- which are a bit bulky -- how do you physically manage this while shooting portable? Wear it on your belt? Use AGC for levels? That Micro SD to SD Card adapter doesn't have any active circuitry in it. It's just copper traces (wires). It's a good thing to have, so that you can insert your Micro SD cards into your standard memory card reader. These memory cards are getting smaller and smaller. My new Le Pan tablet takes the micro-sd card. This memory card is smaller than my thumbnail. These memory devices become really important when you fill them up but the small ones are easily lost or misplaced. I misplaced an important USB memory stick this week, and I was in a panic until I found it again. That memory stick is now lassoed to a lanyard that is tied to my belt. Now I would need to lose my pants to lose the card. So far I have never lost my pants (but there is always a first time for everything). Isn't it possible to have a USB microphone automatically recognised as such with the Android operating system? My Zoom H2 is usable as a live USB connected external mic, and apparently the H4 can manage that trick too - then you'd only need somewhere to fasten it during videos, possibly with a USB extension. Don't forget the AA rechargeables for the microphone! While in Germany, go to the next shoe store and try a pair of Rieker's. Not too expensive, but really really comfortable. I don't buy others since about 20 years or so. I like your bag choice, I have the Retrospective 5 which can carry the OMD, 3 lenses, a flash and a lot of other tiny things. It is very strong, rugged, and unassuming. By the way, my lack of frequent comment is caused by the incompatability of the theme you're using with my phone and iPad, I can only read your posts easily from an RSS reader (Google Reader, and now feedly). I'm commenting from my laptop now. Sorry about the crazy blogger stuff. I'd love to switch to a word press blog but and too busy and too lazy right now to go through yet another big learning curve... We'll keep working on it. I am a bit confused about how the Azden mic fits in. You cannot plug the Azden into the Samsungs, and I understand the Zoom has its own built-in mic. Are you going to plug the Azden into the Zoom? I guess it will record sound differently from (better than?) the Zoom mic. And how will the Zoom be supported? Best of luck with this set up. Thanks for clarifying. I had come to understand that you were going to exclusively use the Samsungs on your trip to Europe and that you had purchased the Azden for use on that trip. I haven't used an external mic in a while, but will be interested to read any future comments you have about your Azden mic. Have fun. I can see how you got that from what I wrote. I am taking the mic and the Zoom but I'm not sure how I'll use it yet. I can stick the Zoom in my pocket and run a cord to the mic but who knows. Mostly (to be painfully honest) I used the trip as an excuse to buy a fun, new toy... (Hope the CFO isn't reading...). I have several micro-SD cards now. I have two class ten 64Gb cards, one in my phone and the other in my Android tablet. I am leery of putting such a big card in my A77 though for fear it will go bad and leave me with 64Gb of images gone. If a card craters in my camera, I would rather have a 16 or 8Gb card go on permanent vacation. It's very cool though because my Android Rezound phone with it's 32Gb internal storage and 64Gb card, has made my old Zune music player obsolete. Looking forward to hearing about your trip, Kirk. New lands, new faces and new gear - very exciting. I use the Zoom H4n for dual sound and sync up sound tracks in the video editor. I highly recommend the little wired remote control unit for the Zoom. I usually put a belt clip on the tripod socket of the Zoom, hang it on my belt and put the remote in my shirt pocket. I think the Samsung approach is terrific. Instead of putting a camera on a phone, put a phone and OS on a better camera. The immediacy of uploading scout photos, proofs, etc to a client and interacting remotely will be, very soon, the expected norm. Can't wait to hear/see your reactions to the NX Galaxy. The posted content in this blog seems quite informative and it helped me a lot to explore more about Best USB Flash Drives . Thanks for sharing such userful post..